Massive dumps of scrap tyres could become a thing of the past, thanks to a high-speed flat-packing system, which will make recycling much easier, and reduce the space needed to store and transport them. The new SymTyre-S300 semi-automatic tyre cutter, which is small enough to be used by neighbourhood garages, works fast, reducing a tyre completely in 60 seconds and making it impossible to use again except for recycling, or as a feedstock for waste-to-energy or waste-to value recovery. Instead of having to remove waste tyres en masse, with all the cost and logistic inefficiencies of transporting whole tyres, garages can now flat-pack them on site, and the valuable components of rubber and steel can be recycled later. Once tyres have been cut into sections they occupy up to 70% less space for storage and transportation purposes. The SymTyre-S300 has been developed for Symphony Recycling Technologies Ltd, which is a subsidiary of Symphony Environmental Technologies Plc, the AIM-listed environmental technology company. Symphony, which operates in over 90 countries, is a world leader in environmental plastics and in recycling technologies, and has recently completed a major project with Imperial College London, funded by the British Government.Recovering the material from tyres in a commercially-viable way has long proved a difficult – and until now – almost impossible task, which has contributed to the difficulty of disposing of scrap tyres. For the first time the technology used in this system allows tyres to be cut into three parts in one process: the two sidewalls and a tread. It then makes a transverse cut of the tread, turning it into a strip of rubber. When the tyre has been dismantled, the components can be loaded into a specially designed cage or ‘stillage’ leading to considerable space and energy savings in storage and transport. More recycling is essential, but since the invention of the highly durable pneumatic tyre by John Boyd Dunlop in 1888, disposal has been a problem. Today, the Environment Agency estimates that the UK produces around 55 million scrap tyres a year and since most of the tyres can no longer be sent to landfill, they have to be disposed of by other means. 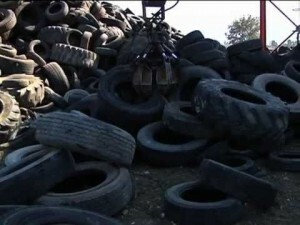 Scrap-tyre dumps are an unsightly and inefficient use of land, and can lead to uncontrolled fires causing major pollution, and infestation by vermin. In hot countries mosquitoes breed in the rainwater collected in the tyres, and they spread malaria and other dangerous diseases. Symphony believes that the SymTyre-S300 will allow more control over the way scrap tyres are disposed of. It should reduce illegal tyre-dumping, and opportunities for organised crime in the scrap-tyre trade featured recently on television. Symphony Recycling Technologies are planning to offer a collection service for the flat-packed tyres from garages and tyre depots. The machines will be available on a sale or rental basis and the company sees a healthy demand for them through its distribution network across the world.